FORTE 10 Basic is a great deal for all of those in need of an entry-level version of FORTE. This edition is great for students and beginners. FORTE 10 Basic gives users everything they need for simple music scoring tasks. It’s a perfect fit for everyone who wants to explore the world of digital music notation without a long training period. The typical key tools of FORTE are included already. You may not be new to creating music, but is composing with music notation software new to you? FORTE Basic makes it easy for you to explore the world of digital music notation software and compose with confidence! This entry-level edition of the FORTE product family is perfect for students and songwriters delving into digital composition. It’s also a great product for teachers helping students learn to write musical notations or the musician who wants to chart out the songs you’ve written by ear or with basic chords. All Forte products are designed by musicians for musicians, and we know that you don’t want to waste time with tutorials when you could be creating music instead. You won’t have to go through any long training programs to become a master at writing your own scores with music notation software. We designed the Forte interface so that you could learn the system easily, quickly, and intuitively; you’ll pick up on how to use Forte BASIC in mere minutes. •	Seamless control for both multi-functional and single functional use. •	Available time signatures: 2/4, 3/4, 4/4, 5/4, 6/8, 12/8, c and alla breve. 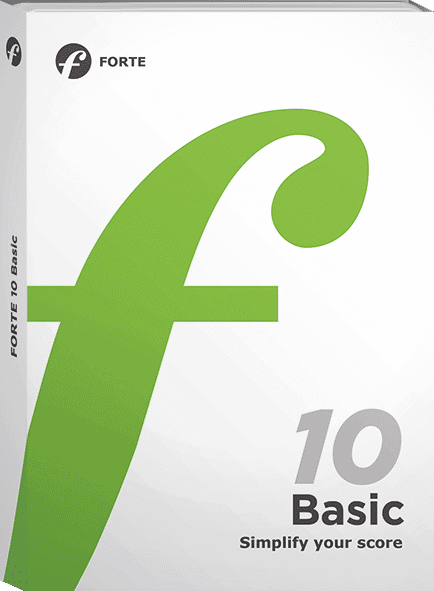 If you’re looking to explore digital music notation without a long training program, then FORTE 10 Basic is for you.